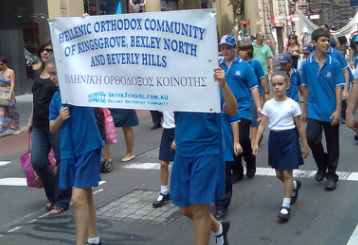 The HELLENIC ORTHODOX COMMUNITY OF KINGSGROVE, BEXLEY NORTH, BEVERLY HILLS AND DISTRICTS is a non-profit organisation established in the Rockdale (Sydney NSW) municipality over 50 years ago. Its origins stem from the desire of the Greek Community in the local area to offer its children the opportunity to learn their mother tongue and preserve their Greek national culture and traditions. The independence of the Community is enshrined in its constitution as its main objective, which has the active support of the parents, teachers and managing committee. The committee work arduously & voluntarily in the background to promote and maintain the school’s profile and raise the necessary operating funds by social events such as the Annual Dance, and end of year celebrations. The Community, never loses sight of its aim which is to ensure that the Greek language and culture are taught. Lesson duration is two hours per week and the school holds classes most afternoons from 3:15 pm to 5:30 pm at Bexley North, Kingsgrove, Beverly Hills, Peakhurst West and Lugarno public schools. However, the sense of community and experience of the Greek culture and traditions is spread throughout the year with organised events such as 25th March (Greek Independence Day), 28 October (OHI Day), Annual Greek Dance and Christmas Party. Emphasis is given to the teaching of the Greek language and the pupils are actively encouraged to speak Greek.